As the world’s population continues to press into what were once uninhabitable territories, we are left with distressingly little space and diminishing natural resources. Troubled by tensions that inevitably arise when civilization intrudes upon wild regions, Alison Hawthorne Deming set out to answer questions that had long been in her mind. By what do we measure our progress as a civilization? In the absence of vast frontiers, can we manage our ever-increasing numbers? How can we strike a balance with a natural world that we threaten with our very presence? To find answers, she visited and lived in some of the more remote regions of our continent—southern Mexico, the Bay of Fundy, the islands of the Sea of Cortez—the edges of our crowded world. In places where fishing and logging are depleting the sea and land, and farmland has been handed over to developers, Deming sensed the pressures that tourism exerts on communities reluctantly willing to promote their regions’ natural beauty. But what she also found was a fragile optimism that a new way of life may be created—one that reconciles the conflicts between the advance of civilization and the need to preserve our shrinking wilderness. 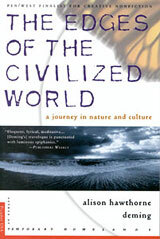 The Edges of the Civilized World is a beautifully written, honest, insightful, and throught-provoking book. With the language of a poet and the eye of a scientist, Alison Hawthorne Deming presents us with the difficult challenge of redefining our traditional notion of cultural progress and thinking of our future in new terms. Deming probes what it means to be civilized . . . Let’s be civilized animals ourselves, she is saying, so we can take better care of other species. She takes heart in citing the “fundamental similarity” between the poet and the scientist (“both are seeking a language for the unknown”) and avows “a deep and abiding faith in human beings,” based on our love of beauty and passion for learning, positive viewpoints that enable her to embrace change, the force many fear and resist, as inevitable and endlessly enlightening.